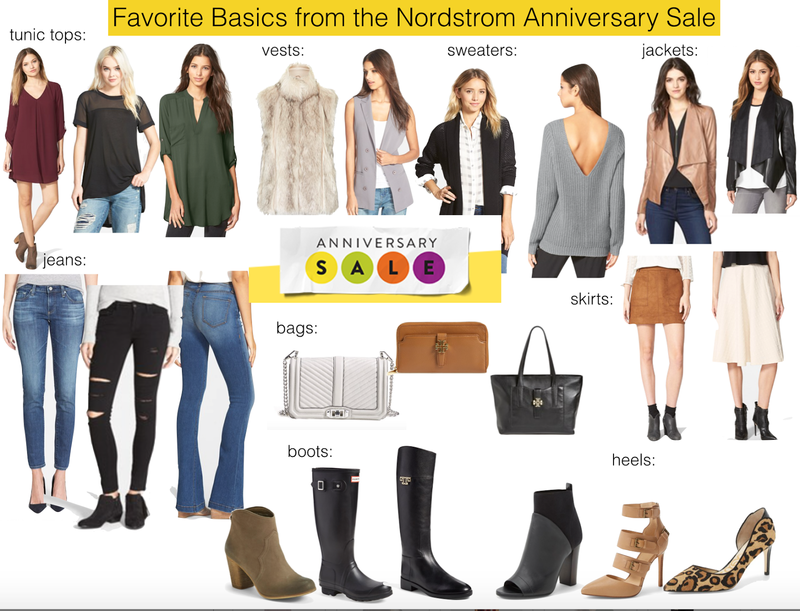 Today the Nordstrom Anniversary Sale opens up to the public. I have put together some of my favorite, basic pieces for fall that could be incorporated right into your current closet. tunic tops // are my favorite tops to wear. You can tuck the front into jeans like here, pair with leggings, boots and a vest or if it is long enough, throw on a pair of booties. vests // I love vests! I especially love the faux fur ones as they are super chic and look great with denim or dresses. I ordered the Blazer Vest above and I think I am going to order the faux fur today as well. sweaters // cozy knits are perfect for fall and winter. You can keep your colors basic or choose a nice burgundy like this one or I love this color option too. jackets // everyone needs an awesome faux leather black moto jacket. These two are so perfect it is beyond words. The drape collar is a fun alternative to the classic style and the tan color is amazing! jeans // If you buy one pair, I say make them flares! I bought this pair and they are $38.90! I missed out on the black pair but hope they restock them ASAP and this pair is a great basic skinny. bags // I am super excited as I ordered the Rebecca Minkoff Chevron Quilted Love Crossbody Bag and I cannot wait for it to arrive. This Tory Burch zip wallet is a fabulous price and the Tory Burch Hobo is a darling fall/winter bag. skirts // I am so in love with this faux suede mini and this midi skirt will be perfect with booties, tall boots, tights, sweaters or a button up! boots // I am so excited for you guys, if you do not own a pair of rain boots yet, run and buy these Hunter rain boots. I wore my Hunters all over New York last year when I was pregnant and they are the most comfortable rain boot ever! These riding boots are amazing for the price and you need a good riding boot for fall. You all know I am obsessed with booties too and this pair is only $79.90. heels // you're probably wondering why peep toe booties for fall? Well are they not just the cutest ever? Obsessed! And I do live in California, which means I have a relatively mild winter which allows me to wear peep toes. And the pointy toe pumps with buckles my oh my. Lastly, I loooove these leopard pumps because they have a 2" heel and will give you the perfect amount of flare with your basic outfits. I know it seems a bit crazy to buy all of this fall/ winter stuff now but I promise you that come the colder months, you will be so happy you did at such great sale prices.